It's so much fun to dip into Classic Elite Yarns' extensive pattern archives. 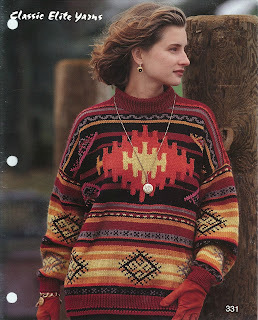 On my last archaeological, fashion dig, I kept coming back to these fabulous intarsia sweaters from the 1980s and '90s. All of these patterns are available for digital download from Patternfish. I couldn't resist sharing some of my favorites. #183 Polka Dot Pullover designed in La Gran mohair for the 1986 collection. Designer unknown. Modeled by a teenaged Uma Thurman, #230 by Sally Lee was designed for the 1987 collection. Also in La Gran. #345 Rosa Rugosa by Michele Rose in Newport cotton. 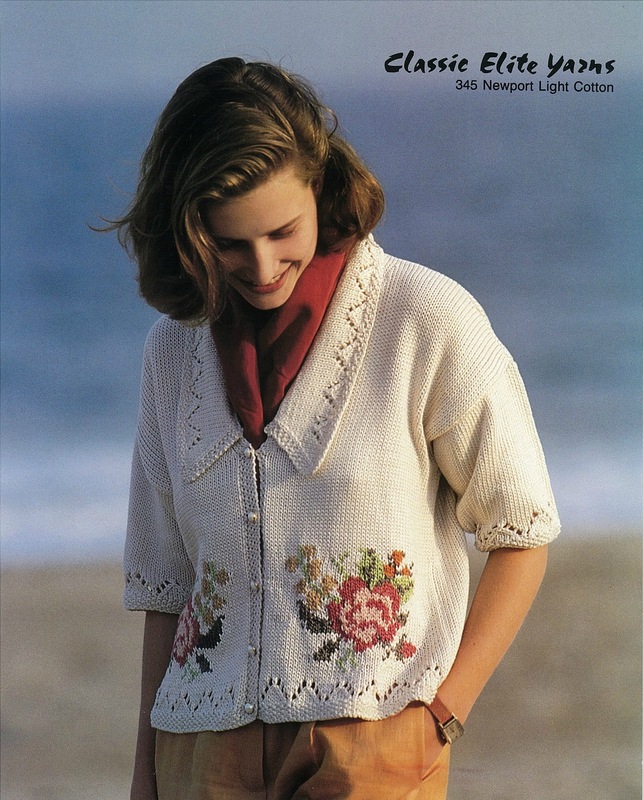 I knit with Newport in the mid 1990s, but now I love our Provence cotton even better. 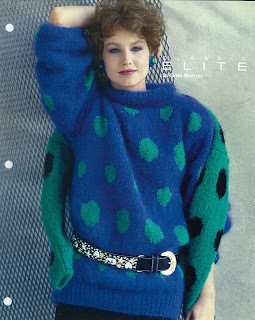 Classic Elite's Creative Director, Susan Mills says intarsia motifs are favorites of designers as there are few limitations. You can think outside the box and not be confined to thinking only in rows. With intarsia, designers can become painters, putting color all over the place. She notes the challenges to designers (who can't quite find the colors they imagine in available yarn lines) and to knitters (who may be daunted by charts and lots of ends to weave). But in the end, a completed intarsia sweater is an accomplishment that proves your knitting chops. What's Susan's favorite intarsia design? 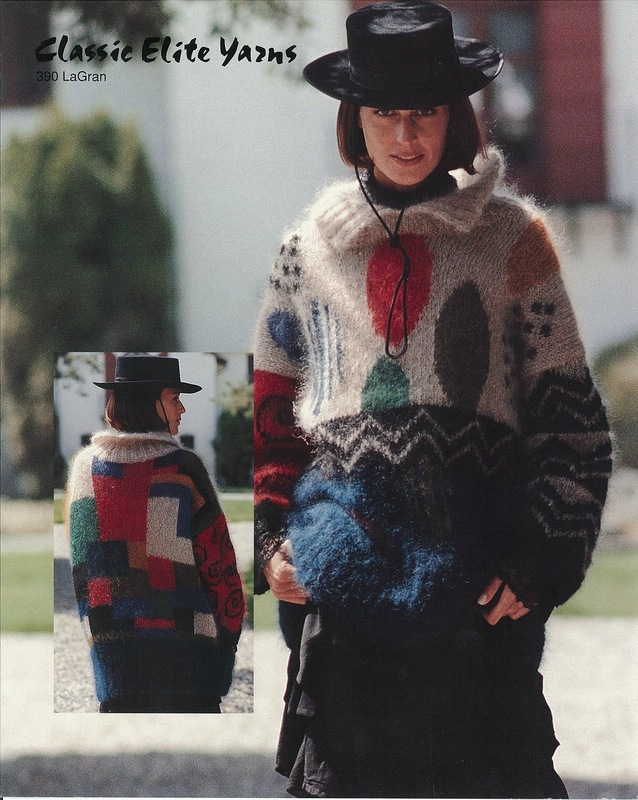 This pullover from 1992 by Sofia Delaunay is the winner. 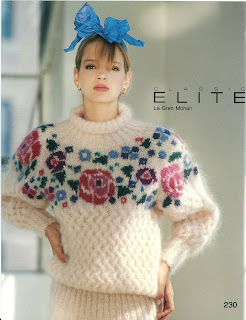 Susan knit it for herself in '92 in La Gran. She wore it so much over the years, she completely wore it out! That's sweater love.